Not every job is reliant on typing and staring at a computer for hours on end. It’s strange, I know. For those of you out there working with fabrics on a regular basis, ironing and steaming are a common occurrence. It would make sense that you would have both an iron and a garment steamer, but for those who like to save space, combining the two would be an ideal setup as it would also save you the trouble of going from one device to another. While you can sometimes find a bargain, a gadget or gizmo that costs $30 is likely not going to be as good as its $300 counterpart. The same can be said for the Rowenta Steam Iron Station. This may be an iron, but it’s also a garment steamer, and holds more water than your average iron, justifying its hefty price tag. Not only will this heat up in 3 minutes, but it will put out continuous, high-powered steam. It can hold up to 33 ounces, giving you 90 minutes of uninterrupted steaming time. Even if you notice you’ll run out of water in the tank after an hour of working, you can fill it at any time. There are 400 holes on the bottom of the stainless steel sole-plate, meaning you’ll get evenly distributed steam for whatever the job may be. 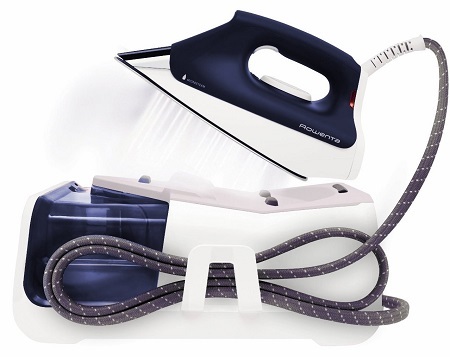 It has a 6′ steam cord, 12′ power cord, and costs $239.99 for a set up that will do 3 times the work of a regular iron.